Since passing New Zealand's East Cape yesterday afternoon (UTC), the six VO65s have been heading out into the open water with their next landfall set to be Cape Horn more than 4000 miles away with the breadth of the Pacific section of the Southern Ocean before them. The crews are still feeling the effect of Cyclone Pam even though its centre is now some 800 miles to their southeast with five metre waves and 25-30 knot southeasterlies. At East Cape yesterday the fleet split in two with MAPFRE, with skipper Iker Martinez back in charge, first to gybe into the cape, followed by Abu Dhabi Ocean Racing, Dongfeng Race Team and Team SCA, leaving Teams Alvimedica and Brunel on a more northerly course. 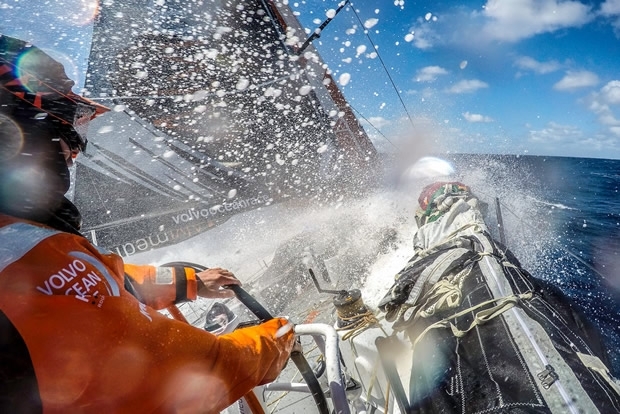 Since then MAPFRE has dived off on the most extreme southerly course but has since cracked off a little leaving Abu Dhabi Ocean Racing the most southerly boat, some eight and a half miles SSE of MAPFRE. Team Alvimedica currently holds the most northerly position with Team Brunel having cracked off slightly and now technically holding the lead - assuming you take as the next waypoint one of the northerly points of the Antarctic exclusion zone. For this leg the VOR organisers have followed the Barcelona World Race's example in having an ice avoidance zone, comprising a series of waypoints which competitors are prohibited from dipping below. Yesterday the first half of the limit of this exclusion zone (ie the mid-Pacific section) was shifted north by 1-2°, so there is now a big 'hump' in the line of the exclusion zone taking the boats up to 53°S between 120-110°W. There is no word from the organisers as to why they have made this change, but presumably it is in light of the latest satellite images showing the whereabouts of bergs in this area. The teams are currently making hay, with all the boats sailing at 20+ knots with the wind hovering around the 25 knot mark and slightly backed (240°) for the boats in the north, compared to Abu Dhabi Ocean Racing (220°). However this fast progress looks set to be short-lived, due to Pam doing a horizon job on the boats and them coming under the influence of a substantial area of high pressure that is forecast to slowly move northeast off the east coast of New Zealand. Over the course of this afternoon (UTC) and into this evening the boats will see a major header, the wind into the SSE by the early hours of tomorrow morning, pushing on further into the ESE by tomorrow night leaving the boats not only on the wind, but with the favourable port tack taking them closer to the centre of the high and less wind. The present forecast indicates that the crews may have to wait until Monday or Tuesday before they can get back into 'proper' Southern Ocean conditions as they shake themselves off the clutches of the high. The sounds from up on deck last night were amazing. As the waves grew, the carbon fiber began to flex and you could hear the water deluge onto the deck rhythmically as the boat lurched through the growing swells. Squalls of rain showers – churned up in the wake of Cyclone Pam – gently filled in the silence between waves. Yet overshadowing the noise of the water were the voices of everyone up on deck shouting through sail change after sail change. Peeking out of the hatch, between the clouds in the night sky was the Milky Way and to our left stood the headlands of East Cape. Four sets of lights were on the horizon less than a mile ahead of us. We were now sticking our nose out past the protection of the terrain of New Zealand into the huge waves and winds from Pam. The wind quickly grew into the 20-30 knot range and as we were downsizing our sail area to compensate a massive snap echoed throughout the hull. The bulkheads shook with the force of several tons of energy being released all at once. Several people shouted the forestay had blown as the headsail went slack. However, fortunately it was our running backstay that had slipped out of its winch – and easy fix and we were back into it again. Everyone has been silent below deck so far – talking is a luxury, right now we just want to try and keep down a meal. The sounds above and the roller coaster ride downstairs are enough to drive your imagination.